When did April Fools’ Day begin? A giddy spurt of practical joking seems to have coincided with the coming of spring since the time of the Ancient Romans and Celts, who celebrated a festival of mischief-making. The first mentions of an All Fools’ Day (as it was formerly called) came in Europe in the Middle Ages. Some trace April Fools’ Day back to Roman mythology, particularly the story of Ceres, goddess of the harvest, and her daughter, Proserpina. Pluto, god of the dead, abducted Proserpina and took her to live with him in the underworld. The girl called out to her mother, but Ceres could only hear the echo of her daughter's voice and searched for her in vain. Such "fool's errands," or wild goose chases, became a popular practical joke in Europe in later centuries. 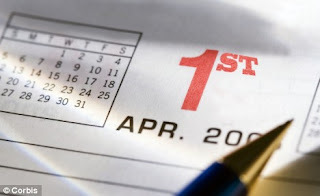 The most widespread theory of the origin of April Fools’ Day is the switch from the old Julian to the Gregorian calendar (now in use) in the late 16th century. Under the Julian calendar, the New Year was celebrated during the week between March 25 and April 1, but under the Gregorian calendar, it was moved to Jan. 1. Those who were not notified of the change, or stubbornly kept to the old tradition, were often mocked and had jokes played on them on or around the old New Year. In France, this took the form of pranksters sticking fish on the backs of those who celebrated the old custom, earning the victims of the prank the name Poisson d’Avril, or April Fish. But the theory can't explain why the pranking tradition spread to other countries in Europe that did not adopt the Gregorian calendar until later. In Scotland, the butts of April Fools’ jokes were known as April "Gowks," another name for a cuckoo bird. The origins of the "Kick Me" sign can supposedly be traced back to the Scottish observance of the day. In more recent times, radio stations, TV programs and Web sites have set up gullible readers and listeners. One of the most notorious jokes was a 1957 hoax BBC documentary of the annual spaghetti harvest in Switzerland, featuring a family plucking strands of the pasta from "spaghetti trees." The Italian favorite was still considered an exotic delicacy in Britain at the time, and many listeners were so fooled they wanted to find out how to get a spaghetti bush of their own. On April 1, 2007, the Internet search engine Google announced their Gmail Paper service, where users of the free e-mail service could save e-mails to a paper archive which Google would print out and mail for free. Last year, Google invited people to sign up for a Mars exploration project. So while you're surfing the Web or watching TV, be wary of what you see and read, or you could end up an April Fool!